1897 saw the formation of the Woman’s Library Association in Grand Junction. This organization had determined a need for a free public library in the city and was dedicated to making the goal a reality. In 1900 the association received a promise of $5,000 from renowned philanthropist Andrew Carnegie to build a new library. Construction began on the corner of 7th Street and Grand Avenue which is only 2 blocks away from the location of the Central Library today. The area on 7th Street between White and Hill Avenue was one of the foremost neighborhoods in town. Today, the area is listed as an historic residential district. 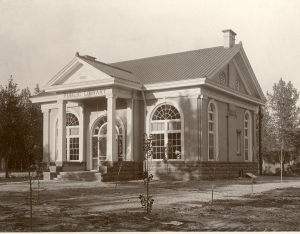 The dedication of the new library took place on Thursday, July 25 1901. Mayor Joseph M. Sampliner was the master of ceremonies at the event and several speakers appeared in front of the audience. Architecture in the building was based on the Greek style of design and featured large Corinthian columns and cathedral windows. The library was also completely fireproof and was supported by an iron framework. Other noteworthy features included a fireplace in the center of the building and beautiful fixtures throughout. Stairs lead to the basement, where the furnace was located. Grand Junction publisher I.N. Bunting was the keynote speaker and in his address he praised the value of American libraries, education, and also the contribution that Andrew Carnegie made to the endeavor. Grand Junction was undoubtedly excited about it’s brand new library.